176 Marlborough is located on the south side of Marlborough, between Dartmouth and Exeter, with 174 Marlborough to the east and 178 Marlborough to the west. 176 Marlborough was built in 1876-1877 for dry goods merchant Eben Jordan (founder of Jordan, Marsh & Co.), one of six contiguous houses (166-168-170-172-174-176 Marlborough) built for him between 1874-1875 (166-168-170-172 Marlborough) and 1876-1877 (174-176 Marlborough), designed as three symmetrical pairs of houses. 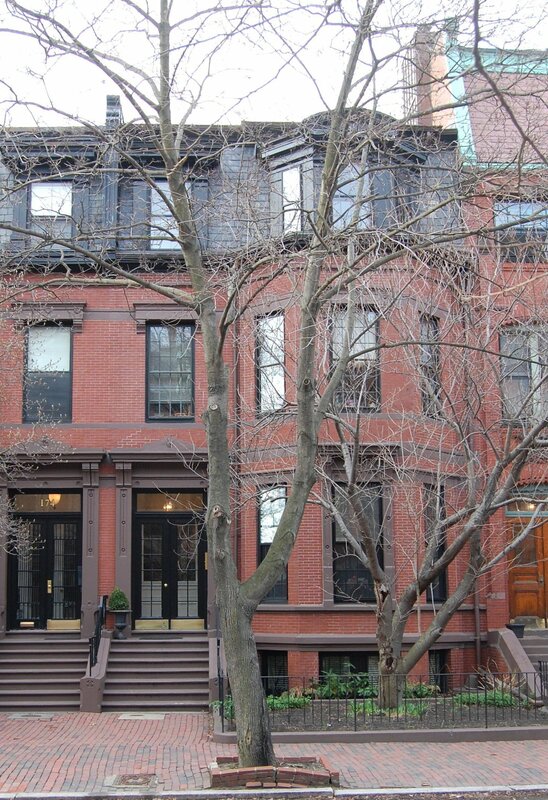 Click here for an index to the deeds for 176 Marlborough. On January 23, 1879, 176 Marlborough was purchased from Eben Jordan by Miss Effie Ellis. Effie Ellis was the daughter of Charles Mayo Ellis and his wife, Harriet (Lewis) Ellis. He was an attorney and early abolitionist who, in 1854, had acted as counsel for Anthony Burns, the fugitive slave whose arrest in Boston under the Fugitive Slave Act became a major abolitionist rallying point in New England. Effie Ellis had lived with her father and his second wife, Helen (Thomas) Ellis, at 129 Commonwealth and in Brookline before their deaths in 1878, his in January and hers in December. After she moved to 176 Marlborough, her half-sister, Helen Ellis, lived with her. Effie Ellis and probably Helen Ellis continued to live at 176 Marlborough during the 1883-1884 winter season. During the 1884-1885 season, Effie Ellis (and probably Helen Ellis) were visiting relatives in Los Angeles and 176 Marlborough was the home of P. H. Bridge. By the 1885-1886 winter season, Effie Ellis was living there again, and Mr. Bridge was not. Helen Ellis probably continued to live at 176 Marlborough with Effie Ellis until June of 1893, when she married Rev. Stopford Wentworth Brooke, pastor of First Church. 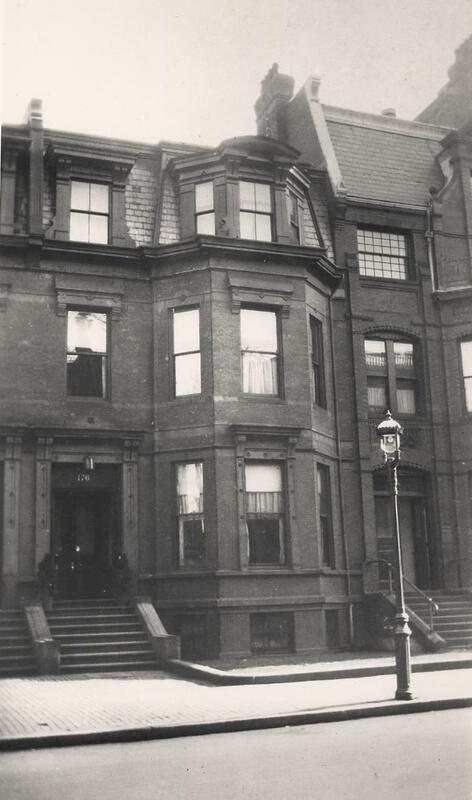 After their marriage, they lived at 9 Exeter. By the 1886-1897 winter season, Effie Ellis had been joined at 176 Marlborough by Miss Ellen V. Richardson. They continued to live together in 1898. During the 1898-1899 winter season, Effie Ellis traveled to Europe and 176 Marlborough was the home of coal and wood dealer George Peabody Hamlin and his sisters, Harriet Gertrude Hamlin and Jane Griswold Coit Hamlin. They previously had lived at Haddon Hall at 282 Berkeley. By the 1899-1900 season, they had moved to the Hotel Somerset. and by the 1901-1902 season to 185 Bay State Road. By 1900, Miss Ellis (but not Miss Richardson) was once again living at 176 Marlborough, and continued to do so until her death in May of 1924. 176 Marlborough was not listed in the 1925 Blue Book. On February 17, 1925, 176 Marlborough was purchased from Effie Ellis’s estate by Swami Paramananda (Suresh Chandra Guha-Thakurta), director of the Vedanta Centre of the Ramakrishna Mission of India. The Centre continued to be located there until about 1927. By 1929, it was located at 32 Fenway. On October 1, 1927, 176 Marlborough was acquired from Swami Paramananda by William Andrew Bahre and his wife, Jessie (White) Lang Boerstler Bahre, who operated the “School of Insight” at the property. They previously had lived in New York. During the 1928-1929 winter season, they were joined there by Mrs. Salome A. Frost and Mrs. Marie Louise Raemaekers. On May 15, 1929, 176 Marlborough was purchased from the Bahres by The Craigie Foundation. 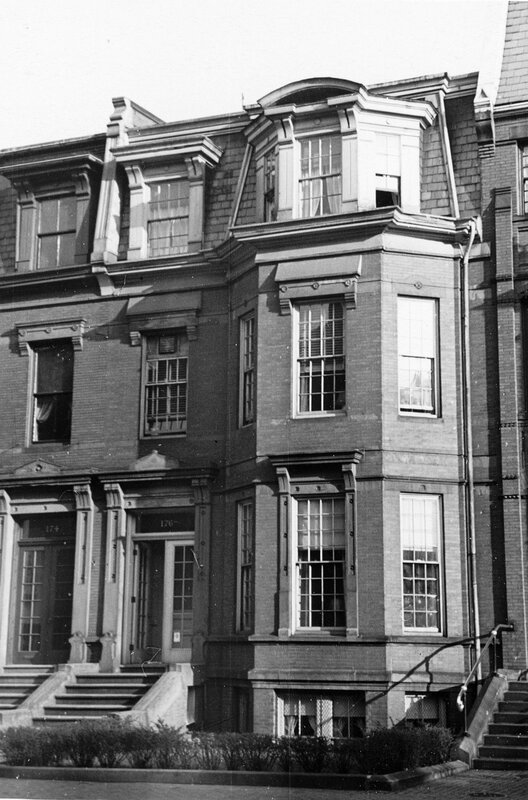 It became the offices of the foundation and the Boston home of its director, Courtenay Baylor, and his wife, Edith (Hedges) Baylor. The Baylors also maintained a home in Auburndale. The Craigie Foundation had been established in 1929 by Rev. Elwood Worcester and Courtenay Baylor when Rev. Worcester retired as Rector of Emmanuel Church. It was created to continue Rev. Worcester’s work (originally called the “Emmanuel Movement”) which combined medical treatment and spiritual support to treat nervous diseases. Through this treatment, Courtenay Baylor, a former insurance agent, had been successful in controlling his alcoholism. He had retired from business and worked as a therapist with Rev. Worcester during the 1920s. Rev. Worcester lived at 186 Marlborough. 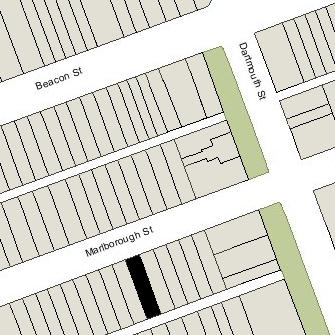 The Craigie Foundation continued to be located at 176 Marlborough in 1935. On July 8, 1935, the Eliot Savings Bank foreclosed on its mortgage to Swami Paramananda, which had been assumed by the Bahres and then by The Craigie Foundation. The bank took possession of the property. It was shown as vacant in the 1936 and 1937 City Directories. The property changed hands and on November 19, 1936, was acquired by Philip Fowler, an oil broker. In January of 1937, he filed for (and subsequently received) permission to convert the property from a single-family dwelling into three apartments, including cutting new window and door openings in the front and rear walls. He and his wife, Opal Frances (Crane) Fowler, lived in one of the apartments until about 1951. They divorced, and in September of 1952 he married again, to Madeline K. Bittman. After their marriage, they lived in New Hampshire. He continued to own 176 Marlborough. On June 1, 1973, 176 Marlborough was purchased from Philip Fowler by Nathan Polsky and his wife, Janet Polsky. They lived in one of the apartments. On September 2, 1983, 176 Marlborough was purchased from Nathan and Janet Polsky by Joseph P. Barri and Jack Venzer, trustees of the BarVen Realty Trust. 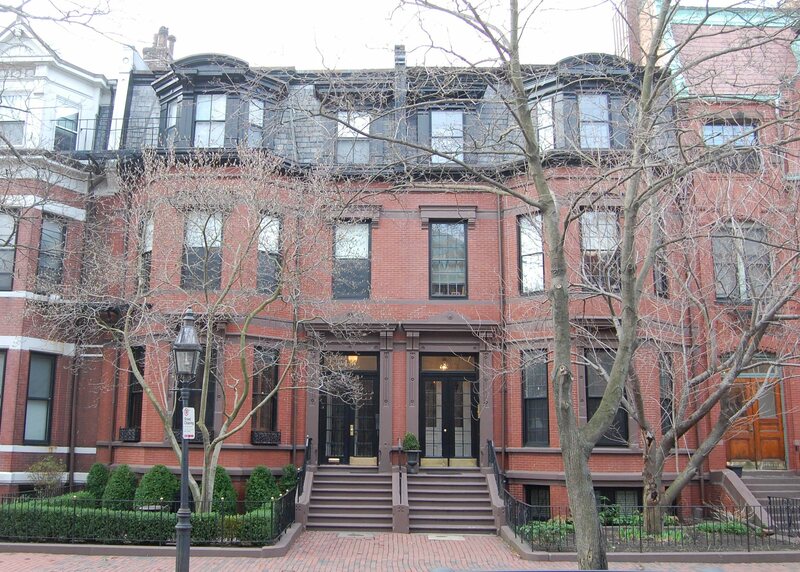 On December 2, 1983, they converted the property into three condominium units, the 176 Marlborough Condominium.